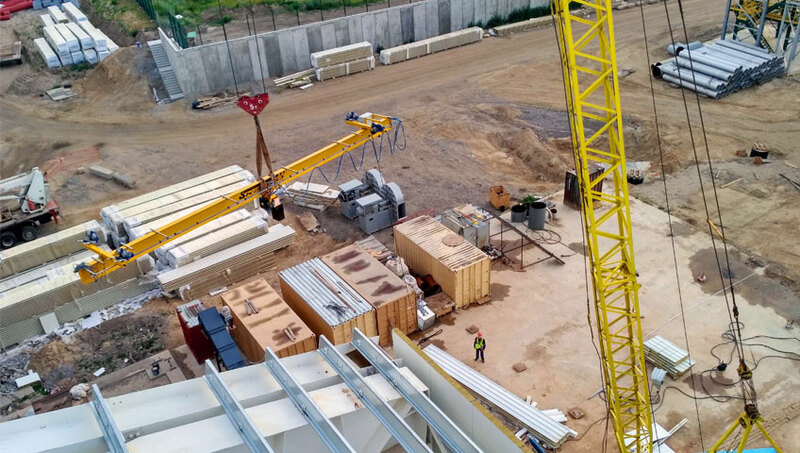 The fourth crane from the enterprise «Kyiv Crane Machinery Plant LLC» was delivered to the permanent Customer in Zhytomyr region. 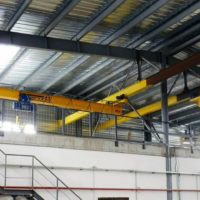 Our specialists have completed the next project at this facility for manufacturing and installation. 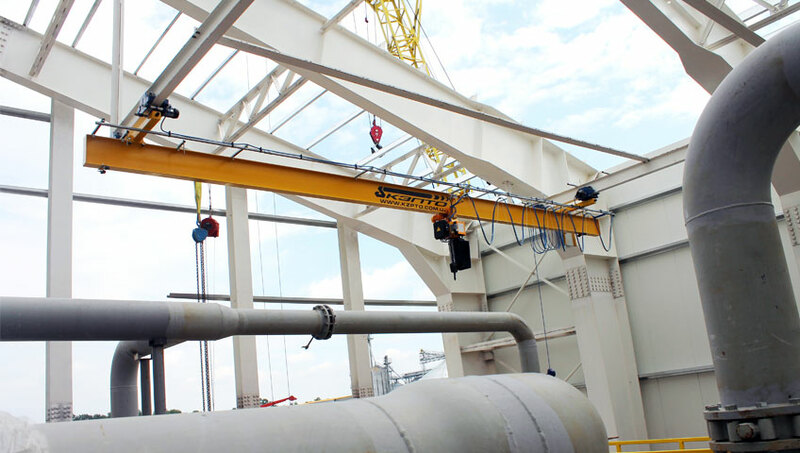 This time it was a single-girder suspended bridge crane with a load capacity of 1.0 t at an altitude of almost 20 m. The crane project was successfully developed in close cooperation with the customer side. 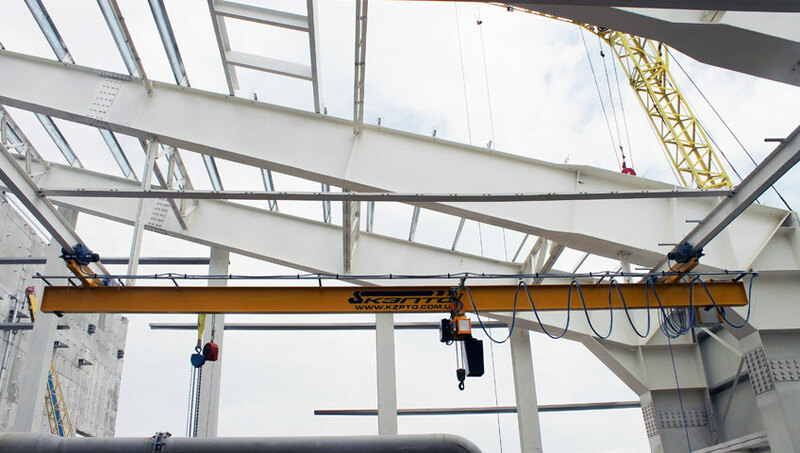 For more accurate operation of the crane when repairing complex equipment, the customer was offered a version of the crane with two speeds, which allowed accurately position the load without jerks and sudden displacements, which also reduced the load on the metalwork of the building during acceleration and braking of the crane with cargo. In addition to the safety of maintenance personnel and to prevent damage to electric chain hoists, a load limiter was installed. 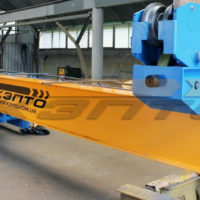 This need was due to the fact that the crane is designed to repair the pipeline and lift the lids, which in turn can "stick" and as a consequence, could damage both the lift engine and the hoisting mechanism as a whole. 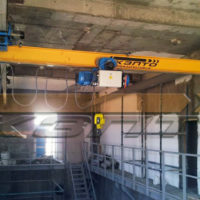 Also, the electric transport chain hoist factory of the Skladova Technika factory (Bulgaria) was an excellent solution that allowed to significantly expand the crane operation area and hook approaches near the wall by 60-140 mm in comparison with the cable hoist hoist of the same lifting height due to the absence of a long drum, on which the rope would wind up at such a height of ascent. 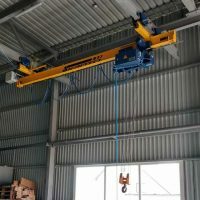 Radio control of the crane and the absence of a cable control panel allowed the operator to bypass obstacles by controlling the lifting mechanism from any convenient point in the shop. 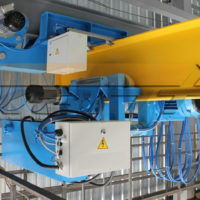 An obligatory clause when installing the radio control panel on the crane is attached a spare cable control panel on the quick-clamping connector, which will allow to continuously service the technological process in the event of a radio control panel discharge or its failure. 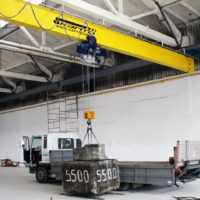 Upon completion of the manufacture and installation of the suspension one-beam crane, the specialists of «Kyiv Crane Machinery Plant LLC» performed control tests with a load for static and dynamic loads, issued a technical report on the installation of the crane, as well as passport and permit documentation for commissioning in Zhytomyrsky expert and technical center. group mode of operation - A5 (medium).